“PetraTherm was officially founded in 2004 after being spun out of a successful mining and exploration company called Minotaur Explorations,” says Terry Kallis, Managing Director of PetraTherm. Minotaur had already established itself as a successful exploration company that had made several notable discoveries, including copper at Prominent Hill. “Basically, Minotaur Explorations is an entrepreneurial explorer/developer, and that is its strength,” says Kallis. 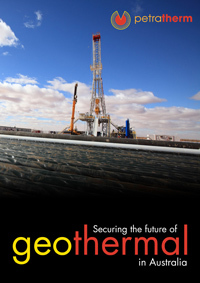 “It has spun out a few companies, and they created PetraTherm with the postulation that they could find hot rocks using its exploration techniques, rather than relying on old drill hole data. This is one of the big differentiators with PetraTherm. 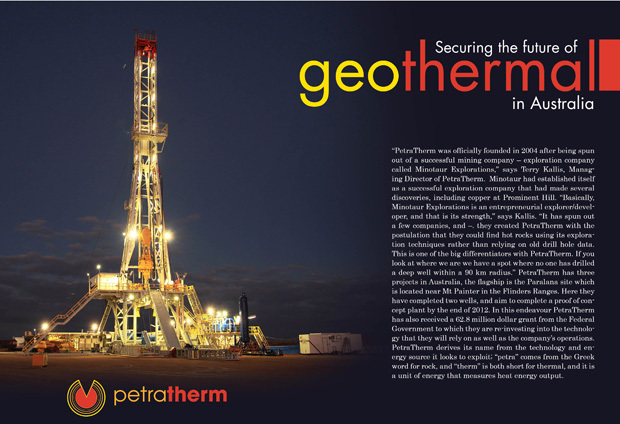 If you look at where we are, we have a spot where no one has drilled a deep well within a 90 km radius.” PetraTherm derives its name from the technology and energy source it looks to exploit; “petra” comes from the Greek word for rock, and “therm” is both short for thermal, and it is a unit of energy that measures heat energy output. PetraTherm has three projects in Australia, the flagship is the Paralana site which is located near Mt Painter in the Flinders Ranges. Here they have completed two wells and aim to complete a proof of concept plant by the end of 2012. In this endeavour PetraTherm has also received a 62.8 million dollar grant from the Federal Government to which they are re-investing into the technology that they will rely on as well as the company’s operations. Their East Gippsland location in Victoria has been awarded a geothermal exploration permit that will allow the company to develop a Hot Sedimentary Aquifer (HAS) project. Their Renmark exploration project is the other project that they are operating in Australia. It is ideally located near two transmission points that are capable of carrying a least 220 MW of power. PetraTherm is also very active internationally. In Spain they have both sites on the Canary Islands and the mainland. With PetraTherm entering China, they have found a role as a partner assisting China through the Asia-Pacific Partnership; it has also made PetraTherm the only Australian geothermal company working within the country. Kallis says that originality in both their location selection and their method of data collection is the PetraTherm difference. He points to the fact that many other companies in the same space are relying on data collected from other exploration companies, where PetraTherm acts on information and intelligence that they themselves have created. Kallis says that the resource they are attempting to exploit comes from large granite deposits, and their collected expertise allows them to find these deposits without having to rely on data that comes from the public domain. “We thought that the best heat sources could be found where there was a source of good insulating rocks, which we knew where around the site we chose in the Flinders Ranges,” he says. “We also had some good anecdotal evidence for the area of course – there was the Paralana hot springs which have been there for a long time and is a small manifestation of this.” The area, Kallis says, is also rich in uranium. “Between us and the Ranges is the Beverly uranium mines, so we know the whole area has lots and lots of uranium in it – and that is the source of the heat.” He says that this demonstrates PetraTherm’s different approach that they take in exploration, but, he adds, they do not discount public data. This point links back to the projects that they have engaged in internationally. “In one tenement there are five wells drilled, and these are volcanic sources in Tenerife. The other location is near Madrid,” he says. “If you look at the projects we have on Tenerife and Grand Canary Island – which are two of the largest Canary Islands – they are using volcanic or magma heat. In Madrid there are two aquifers, these are shallow. The first is about two kilometres in length, the other is about three kilometres, and both are heater by granite with uranium in it like the situation we have here in Australia.” Kallis says that they have a similar site in Barcelona, and in each of these cases they acquired their data which includes flow rates, chemistry and temperature from existing surveys. “What we are looking at is ways to export this energy be it heat or power or a combination of heat and power,” says Kallis. “In Tenerife it will be electricity, and here in Australia, which is really our flagship project is all about trying to prove EGS – or hot rock – development. Once we can do that it has a huge application because the resources here are big, and the potential across the world is big,” he says. When Kallis says that PetraTherm is unique, he does not mean just in its exploration methods, the technology developed for their sites is also unique to the world. HelioTherm, their sister company acts as both their R&D department, and as an interface that makes the technology more accessible and optimises it to produce power at lower and lower temperatures. “PetraTerm’s model on EGS is an optimisation process. So we are not trying to get as hot as possible, we are looking to get power from lower temperatures,” says Kallis. He says that their approach has instead looked at development of products that have established inroads into markets. Kallis says that there is little reason to develop a product that is impossible to deliver. “We have to be able to deliver these products at a competitive price before we even look at what subsidies and grants that we might be getting. Unless you can do that and do it against competition you just won’t be in the game,” says Kallis. He says that the aim has to be to develop the product, which is in their case – power, and then deliver it into the market at a local price. This means that PetraTherm has to also understand transmission, which is one of the strengths that Kallis brings to the business. Then they have to know how to tap into those resources. “This is where we brought in Beach who knows how to drill, and this is where we brought in TruEnergy as a partner because they know how to get us to market,” he says. Part of this continued strategy is to keep their drill depths under four kilometres in order to keep costs of the project low and competitive. “Once you get past that point you are passed the heat flow and delivery to market optimal threshold,” he says. PetraTherm also links up with educational institutions as often as possible, making them not only a cutting edge company but one that is plugged into the vibrant research culture Australia offers at some of its most prestigious institutions. “We are plugged into the University of Adelaide to help us postulate our views on how we explore. One of those people, Professor Martin Hand is now the head of the South Australian Geothermal Research Institute. Professor Richard Hillis remains on our board and has been given a role to head up a co-operative research centre in deep drilling exploration technologies,” says Kallis. Hillis’ role as Chief Executive Officer of the Deep Exploration Technologies Cooperative Research Centre has lent PetraTherm an expert who fully understands stress regimes. They also connect through the university’s engineering school through HelioTherm project. “The number one project is the HelioTherm project,” says Kallis. He says that at this time he is in the process of considering several solar power partners, and that their announcement of the grant that they received has generated a large amount of interest in the work that both PetraTherm and HelioTherm are embarking on.